SnapNDrag Pro is screen capture made ridiculously easy. SnapNDrag started off as a simple app that lets you snap a screenshot with one click and then drag the result off to Mail, Finder or any other app that accepts an image. SnapNDrag maintains a library of all the screenshots you have ever taken. Think of it as iPhoto for screenshots. You can organize by Folders. You can batch rename items. You can type into the search field and get live updates in the browser. SnapNDrag maintains its own Trash so you undo a delete if you need to. 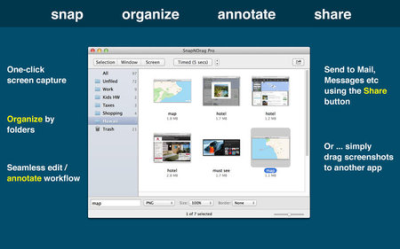 If a screenshot is worth a thousand words then an annotated screenshot is worth a million. Simply double click to open an item for editing in Preview. Use Preview's edit tools to add text, draw arrows or circles. When you hit Save in Preview, SnapNDrag instantly picks up the changes and updates the browser. Since what you're editing is a *copy*, you can easily revert to the original. When it comes time to share, SnapNDrag provides many ways to do that. Use the Share button to send via Mail, Messages, AirDrop, Twitter, Facebook, Flickr. Or drag a screenshot from the browser and drop it into the Mail or Message you're composing - in fact, you can drag it to pretty much any app where it makes sense. And if you're old school, copy-and-paste works too.